Following the Mule Day fun, Aunt Bee Haven Chapter in Anniston, AL threw a party to celebrate the completion of chapter leaders Joel & Whitney Lairds Mayberry room. Ill tell you, it was a sight to behold. The Lairds have created a room that any Mayberry fan would be honored to call their own. The room is filled with Mayberry memorabilia. Framed autographed photos line the walls; a banjo signed by the Darling boys can be found leaning in the corner; one of the limited edition rocking chairs autographed by all the cast members at the 35th Anniversary Celebration in Winston-Salem is there sitting by a window just waiting on Aunt Bee to take a seat. Its a wonderful thing to see but the Lairds didnt stop there. 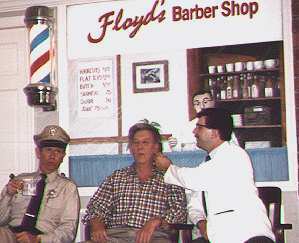 The first thing youll notice when you walk into the room is the beautiful reproduction of Floyds Barbershop. Beside the brick fireplace youll see a painting which looks like youre looking right into the window of Floyds, complete with Floyd sitting in the chair reading the Mayberry Gazette, a working barber pole on wall, and two old style wooden chairs sitting in front . The Lairds really showed off their corner of Mayberry in style with the surprise appearance of Dud Wash himself, Hoke Howell. "Dud" was joined by Barney (David) and Floyd (Allan). 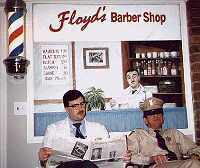 Folks enjoyed having their pictures made sitting in front of "Floyds" with Floyd and Barney on either side while Hoke was busy signing autographs on photos of himself as "Dud" and boxes of "Milk Duds." Hoke recipe in the new Aunt Bees Delightful Desserts cookbook by Ken Beck and Jim Clark is called Duds Milk Dud Cookies. Reports so far indicate that no ones gotten sick from eatin them even though Hoke admits to "making the recipe up." In the March issue of My Sen-Tence, we published the words to that Ernest T. Bass classic "serenade." My Sen-Tence received several comments thanking us for the words to the song but we got one letter that was especially good and we would like to quote a few excerpts for you. TUCKER Men are orbiting the earth etc...When Jim Fritzell and I were writing that we never dreamed that seven or eight years later, when we were preparing the picture, "The Reluctant Astronaut" Don Knotts and I would be in the Houston Space Center having lunch with Werner Von Braun and some of the other German Space Scientists. 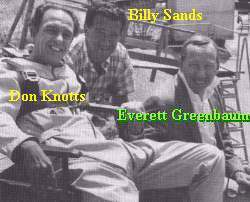 And that a week later in Cape Canaveral (Kennedy) I would be sitting in the capsule (Gemini 2) on the rocket high above the ground. "Old Aunt Maria etc etc" was a jumping rope poem from my wifes childhood in Dequeen, Arkansas. I cant find the script but I think it went "Obedia jump in the fi-ah." Somehow it got to be "Old Aunt Maria" on the screen. If I had known that the show would live this long (and that I would live this long) I wouldve paid better attention. Things are really going good in the electronic world of the "Whos Been Messin Up the Bulletin Board?" The chapter grew from 143 members in March to 211 in June. Weve also seen an increase in the number of folks visiting the "WBMUTBB?" web site on the internet with more than 1760 in June (over 8800 visitors so far)! We recently added a new feature to the web page. Its called "Weavers Department Store." If you visit "Weavers" youll find Bert Miller there waiting to help you find t-shirts, videos, music, and other Mayberry goodies from The Bullet. Of course, Berts not the pushy type of sales man so folk can be sure to enjoy visiting "Weavers." "WBMUTBB" has lots of other things for Mayberry fans including pictures, sounds, and even a new script written by member Jeff Gainer that folks can download. As you might expect, My Sen-Tence has an on-line edition (which you are reading) with color pictures being the only real difference from the printed version. Be sure and join the fun and fellowship on-line if you can. Wow! The end again..... I want to take this chance to tell you about a few BIG events happening around the Mayberry community. First, you may have already heard that Ernest T. Bass impersonator, Phil Lee, and his wife Audrey are "with child" but I didnt want to let the issue slip by without giving this blessed event a mention. Their baby is due July 9th. Now you know why Phil wont be making the trip to the Squad Car Rendezvous this year. Second, you may not know that Jan and I are also expecting our first child sometime around December 19th. "Aw, BIG aint the word for it!" Im glad to report that things are going well and both Jan and the baby are doing just fine. Ill be sure to keep yall posted as the time draws near. Just remember to keep Phil, Audrey, Jan and me in your prayers. Im sure were all going to need all the support we can get and prayers will definitely deliver the kind of support well need . After I thought about it a while and realized that both Audrey and Jan were gonna be having babies soon, I thought it might be a good idea to give the lead man for our trio a call. David Browning is happy to report that he and Patty have no BIG news to report! Names?.....Thats been one of the biggest questions so far. I spoke with Audrey myself and she says that "Ernest T. Lee" is NOT an option and neither is "Ernestine." She sounded pretty sure about that over the phone. I know all thats not exactly Mayberry news but I figured yall would want to know. The Lord has really blessed me in the last couple of years by allowing me to meet so many good people through being "Floyd." Thank you all for the support and the friendship and may God bless you and touch your lives.